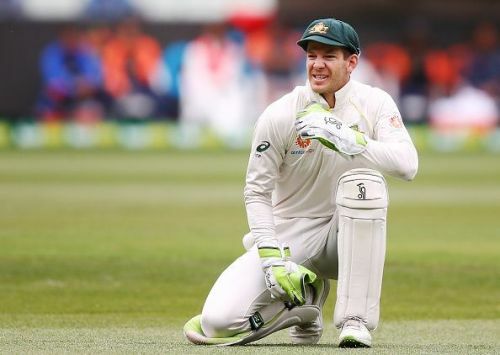 During the second innings of the Indian team, Australian captain Tim Paine tried to use some negative tactics to keep Ravindra Jadeja on the strike for the next over. However, on-field umpire Marais Erasmus took note of this and went on to stop the home skipper from using such defensive tactics. India were struggling at 54/5 when the fourth day commenced. They lost Mayank Agarwal early which invited all-rounder Ravindra Jadeja to the crease. Jadeja and Pant tried to take India's second innings total past 100 as the Australian bowlers began firing on all cylinders. Rishabh Pant was on strike when Pat Cummins ran in to bowl the last ball of the 35th over of the Indian innings. In order to bring the vulnerable Ravindra Jadeja on strike, captain Tim Paine instructed Cummins to bowl the last delivery on the leg side. This was done so that the ball would be left alone by Pant and bring Jadeja on strike for the first ball of the next over. However, umpire Marais Eramus adjudged this delivery as a wide ball and pulled up the Australian skipper for his negative tactics. "If he had bowled a ball down leg and then you had then dived, I would not have deemed it to be deliberate,” the veteran umpire told Paine on the field. The on-field umpire made the use of this law and even issued a warning to the Australian skipper after this. While Paine's ploy to deny Pant the strike is a common one at Test level, the on-field umpire was also well within his right to deem it a wide. Chasing 399, Australia ended the fourth day at 258/8. Notwithstanding the weather forecast, India will be confident of sealing victory tomorrow.